We have finally decided on the book cover, see the image on the side bar. After lots of debate we are really happy with it. We feel it is a strong image and an attractive cover. The designers initially came up with two colour schemes – a fabulously retro brown and orange version with a skull on and the blue and green version with the spine. We really struggled to find a representative image for the work we do, the spine is still a compromise but it speaks of the midline and takes the focus away from just the cranium, we also find we both orient to the spine a huge amount in practice. We could not cope with just a skull, that, plus the title of Cranial Intelligence, felt too narrow a focus. Any craniosacral therapist will tell you that we spend far too much time convincing people that we do more than head massage. We tried a version of an embryo, Ged and I both really liked it, but embryos do not mean much to people without a background in the work. 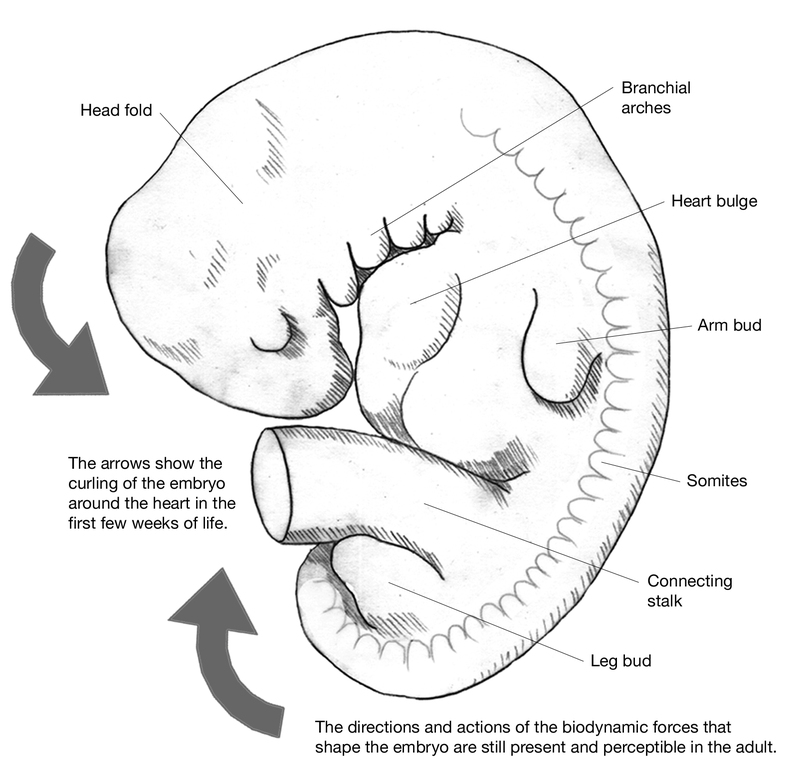 You can see the image of the embryo we nearly used below. We hope you like the final version, please let us know. Absolutely love the blog, really informative and helpful.Well done both of you! I think the bookcover looks great. Nice colors, spine for us normal but for many people a problem. We think we konw her so well but she is still a secret and not to underestimate. Besides always when I look at spines, somehow it referes and connects me to ancient times. A spine still has so much to say and is still super interesting, sometimes they tell me big stories and see pictures in them.